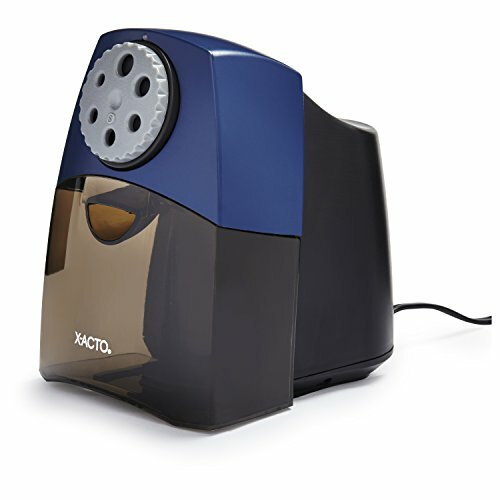 Engineered and designed specifically for classroom use, the X-ACTO TeacherPro Classroom Electric Pencil Sharpener combines smart sharpening technology with rugged construction for dependable performance. This sharpener utilizes a flyaway helical cutter to efficiently sharpen pencils to safe, rounded tips without oversharpening. A powerful and quiet electric motor delivers reliable sharpening power without disruption, while an Auto-Reset feature prevents overheating and possible damage. SmartStop techonology automatically shuts off the motor when pencils are fully sharpened. Adjustable for six pencil sizes, the X-ACTO TeacherPro Classroom Electric Pencil Sharpener is made to reliably serve large classrooms.